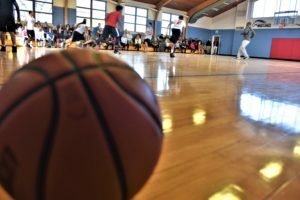 Basketballs thumping against hardwood, rubber-soled tennis shoes screeching, and wooden bleachers rattling under the shuffling feet of spectators.These are the familiar sounds that have long reverberated through the towering rafters of the UMFS Charterhouse School Gymnasium. 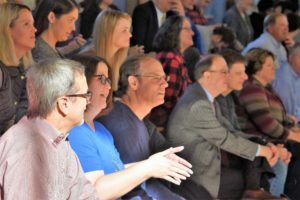 And on a Thursday afternoon in early December, a sound previously unheard in the nearly 60-year-old building had emerged. It was unmistakable. 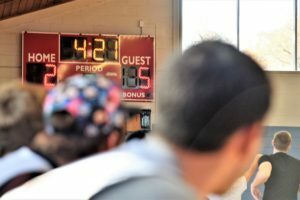 The sharp and staccato signal of the brand-new, full-size scoreboard pierced the air. 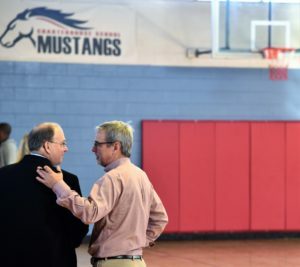 It was a welcome addition to the UMFS Charterhouse School athletics program, and the Mustangs basketball team no longer has to tally scores on an electronic tabletop board. “We’re official now,” said one student-athlete. 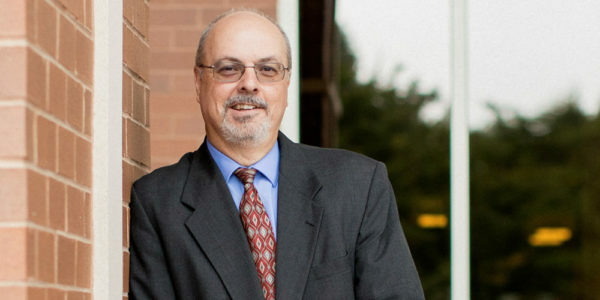 All of this was made possible by the generosity of Mitchell Wiggins. 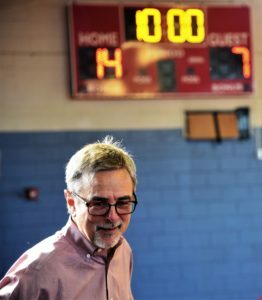 The Richmond-based CPA firm gifted the scoreboard to UMFS in honor of one of its Partners, David Will, who passed away unexpectedly on Sept. 15, 2018, at the age of 57. 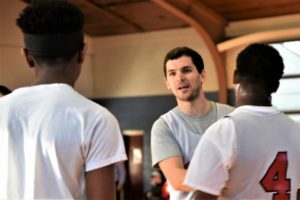 David, a longtime UMFS supporter and former board member, had been a standout basketball player in high school and at Bridgewater College. 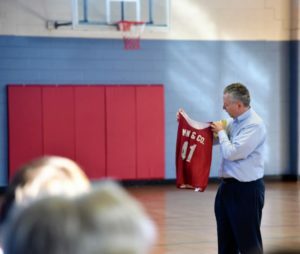 He also enjoyed playing hoops in recreation and church leagues. 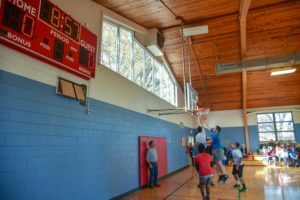 David had a heart for both the hard court and for helping others, so when Mitchell Wiggins learned of the opportunity to donate a basketball scoreboard to UMFS, the firm jumped at the chance. Mitchell Wiggins raised funds to purchase the scoreboard and cover the cost of installation. And after seeing the project through from concept to reality, there was just one thing left to do: play ball. 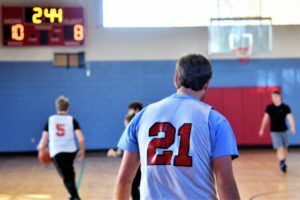 A team of David’s coworkers, family, and friends (pictured above) completed various service projects at UMFS that Thursday morning in his honor and capped the day by joining UMFS Charterhouse School students and staff for a basketball scrimmage. It was an opportunity to light up the beautiful new scoreboard, as well as put a smile on the faces of those who knew David best. 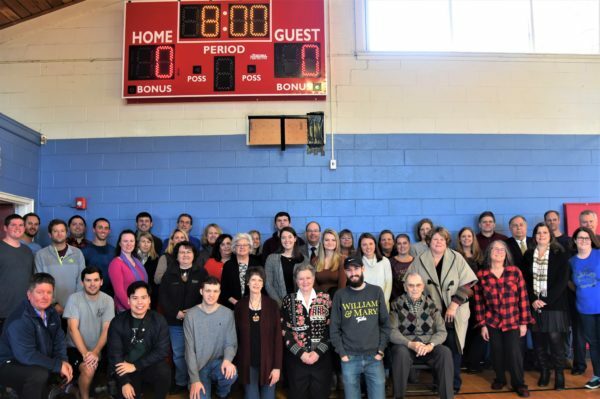 Family, friends, and colleagues joined together in early December to honor David Will (pictured) with a scoreboard donation to the UMFS Charterhouse School Mustangs. It’s the first official scoreboard the Mustangs have had. Melissa Sikes (middle in blue) is a Partner at Mitchell Wiggins and a UMFS Board Member. 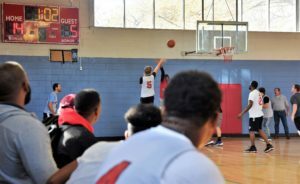 Mitchell Wiggins employees teamed up with UMFS Charterhouse School basketball players for a scrimmage. This layup attempt by a Mitchell Wiggins player would fall and become the first points recorded on the new scoreboard.